The Platform: The platform is very close to being finished. The new platform heaters have been installed and just need to be wired into place. 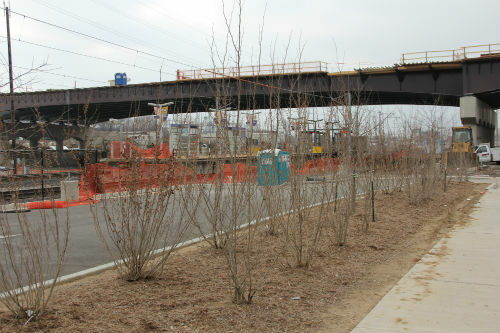 The new walkway connector – remember, we added a connector at the west end and removed the one at the east end – needs hand rails installed. The fence needs to be patched where the old east connector used to be. 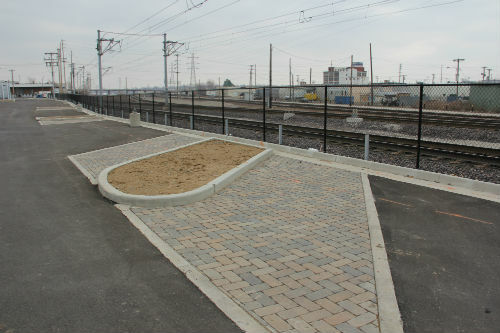 And the ticket vending machines (TVMs) will be removed from the platform and relocated to the plaza area on the south side of Scott Avenue, where they will be easily accessible both to customers coming down from the bus stop above, and to customers using the new park-ride lot to the east. The Park-Ride Lot: Done except striping and lighting. The weather made it easy to finish that part quickly. The Elevators: The new elevator towers have been installed, but they will not go into service until Grand Avenue is open. At that time, they will be tied structurally into the bridge and the actual moving parts will be installed. The New Plaza: The new plaza, which will be built under the bridge where the old bridge piers used to be, has been serving as a staging and work area for the bridge work. 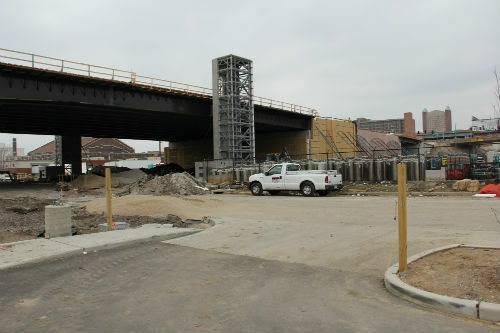 Work on the plaza features could not begin until the bridge work overhead was completed past a certain point. 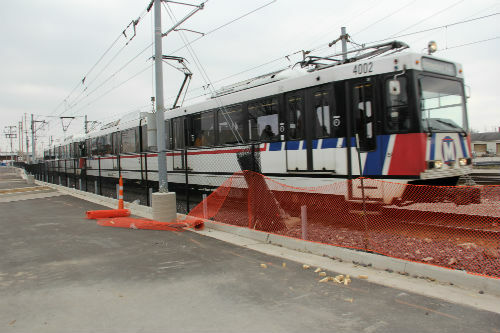 Metro and the City coordinate our work so that both of us can use the area as needed. Scott Avenue: The street is all torn up from the construction, which was part of the plan. It will have to be rebuilt, but there’s no sense in doing so until all the heavy equipment is finished. Also, new utilities need to be run beneath the surface. When the street is completed it will feature a bus pullout at the plaza and a nice, new, safe pedestrian crossing. Bus Stop Improvements: One of the last thing we’ll do is install the new wind shelters and signage up on the bridge. There are lots of different decisions that could be made that would affect the opening date, very importantly the construction status of the Grand Avenue Bridge. We’ll open as soon as we can do so safely, in a cost-effective way and in a way that will result in the best possible experience for our customers. Look into converting the Illinois bus system along the metro line in circular patterns. This should reduce the costs and busses needed and help with metro link passenger numbers in off peak times. You could use max type express routes for the weekday rush hours for the east west historical routes. I also do not understand why Metro does not use a southside tourist friendly bus during the summer. So could we please have some kind of date to look forward to this station opening? A guesstimate would be nice. This has inpacted my life for the last year and I am so looking forward to it being complete. Thank You. With respect, George – I would much rather Metro focus on getting what they have to work and making it easier to use than I would have them invest in a ‘tourist friendly’ bus. Metro already has enough on its plate to deal with, and they still have potential funding issues looming. They have a transfer center at Civic Center that is BADLY in need of a redesign. Their signage and advertising are both horrid. They have buses in need of replacement. In some cases, they have buses with trouble meeting current schedules (thus the quarterly updates). The last thing they need to worry about right now is another branded service. Do you have a ballpark estimate for the station opening date? There are many of us looking forward to it. Our engineers tells me late July – early August as a ballpark figure, so within the next few months. The Grand MetroLink Station is about a half mile north of SLU Hospital. You’ll want to take the stairs/elevator to the top of the bridge above the station and then walk north, or take a quick trip on a southbound #70 Grand bus route.